Universal kinematics as mathematical objects may be interesting for astrophysics, because there exists a hypothesis that, in the large scale of the Universe, physical laws (in particular, the laws of kinematics) may be different from the laws acting in a neighborhood of our solar System. The present paper is devoted to investigation of self-consistent translational motion of reference frames in abstract universal kinematics. In the case of self-consistent translational motion we can give a clear and unambiguous definition of displacement as well as the average and the instantaneous speed of the reference frame. Hence the uniform rectilinear motion is a particular case of self-consistent translational motion. So, the investigation of self-consistently translational motion is technically necessary for definition of classes of inertially-related reference frames (being in the state of uniform rectilinear mutual motion) in universal kinematics. In the paper we investigate the correlations between self-consistent translational motion and definiteness of time direction for reference frames in universal kinematics. In the present paper we construct an expansion of the set of Lorentz transforms, which allows for the velocity of the reference frame to be greater than the speed of light. For maximum generality we investigate this tachyon expansion in the case of Minkowski space time over any real Hilbert space. 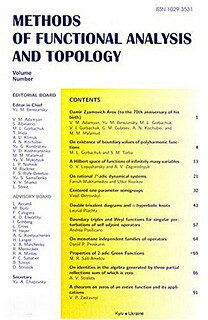 For an arbitrary operator $A$ on a Banach space $X$ which is the generator of a $C_0$--group with certain growth condition at infinity, direct theorems on connection between the degree of smoothness of a vector $x\in X$ with respect to the operator $A$, the rate of convergence to zero of the best approximation of $x$ by exponential type entire vectors for the operator $A$, and the $k$-module of continuity are established. The results allow to obtain Jackson-type inequalities in a number of classic spaces of periodic functions and weighted $L_p$ spaces.